Renault e.dams’ Sébastien Buemi took his second win in a row on the streets of Marrakesh, as the reigning drivers’ champion won from seventh on the grid. Sam Bird was runner-up for DS Virgin Racing, but the real breakout star of the race was Mahindra Racing’s Felix Rosenqvist, who came home in third for his first Formula E podium in just his second ePrix. 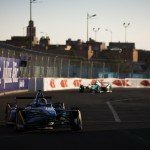 Under the warm North African sun, Formula E once again promised to put on a spectacle around the streets of Morocco’s fourth largest city. With Sweden’s Felix Rosenqvist starting on a maiden pole for both him and his Mahindra Racing squad, and the man who qualified 2nd fastest, Renault e.dams’ Sébastien Buemi, demoted to P7 on the grid due to a technical infringement, there was all to play for as the lights went out to start the first ever Marrakesh ePrix. The race started off sensibly, with no accidents through the first few corners as Rosenqvist got a good start and kept his lead into turn 1. Buemi and team-mate Nicolas Prost battled wheel to wheel on the first laps over P6, with Prost not giving an inch to the championship leader. Rosenqvist reported in the early stages that his dashboard was stuck on the first page, and therefore he didn’t have access to all the usual data; both he and the team hoped this wasn’t a sign of another issue to come. Buemi finally passed his team-mate Prost on lap 3 and then set about catching Daniel Abt (ABT Schaeffler Audi Sport) ahead. Meanwhile Adam Carroll had already made up three places by the third lap, running in P17 for Panasonic Jaguar Racing, while German drivers Nick Heidfeld (Mahindra Racing) and Maro Engel (Venturi) entertained the fans with a close battle over P12. Just ahead in P11, Lucas di Grassi (ABT Schaeffler Audi Sport) tried to drive away from the battles behind him and catch up with the top 10. 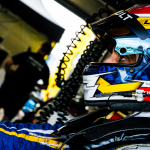 He entered the points on lap 5, passing Robin Frijns’ MS Amlin Andretti machine to move up into P10. Up front, Rosenqvist put in the fastest lap on lap 6 with a 1:24.929, opening up a 2.792s gap over the chasing Sam Bird (DS Virgin Racing). Behind, season 1 champion Nelson Piquet Jr (NextEV NIO) defended the final podium position from Techeetah’s Jean-Éric Vergne. An opportunistic move by Buemi then took him past Abt on lap 7 and up into the top five, while the FanBoost winners were announced as the battling Buemi and Abt as well as di Grassi. Lap 8 saw Vergne finally pass Piquet Jr for third position, as the Renault powertrain started coming to the fore in both Vergne and Buemi’s cars – the latter also setting fastest lap on lap 8. Prost was also able to use the Renault speed to get past Abt on the 10th lap for sixth, as the German driver started to hold up a train of cars behind – which actually benefitted team-mate di Grassi back in P10. Buemi was able to pass Piquet for P4 the following lap, meaning he had made up three places in the first 11 laps. The first casualty of the race would then follow, as MS Amlin Andretti’s Antonio Felix da Costa stopped at turn 8, bringing out yellow flags, but the Portuguese driver was then able to restart his car – albeit in 20th and last. The end of lap 16 saw Rosenqvist and Vergne make their car swaps from P1 and P2, but Bird and Buemi stayed out for another lap. Also stopping on lap 16 were Piquet, Engel, Sarrazin, Heidfeld and Ma, while da Costa had already stopped earlier on. While the car swaps were ongoing, Buemi passed Bird for the lead, with the British driver having to conserve energy in his DS Virgin Racing car. All of the other drivers stopped at the end of lap 17, with Rosenqvist and Vergne regaining the top two places, and Buemi slotting in behind into P3 followed by Bird. The energy roulette had now begun. The massive loser in the car swaps was the unfortunate Piquet, who dropped all the way down to 18th place in the pits with an overly-long stop. This enabled the likes of Prost, Abt and di Grassi to each gain one position. Maro Engel, who was running in P10, also lost a lot of time in the pits and eventually retired from the race without getting out on track in his second car. On lap 20, Vergne was announced as being under investigation for speeding in the pits, and a drive-through penalty was then announced on lap 23. Vergne emerged in P5 after his penalty, desperate to make up some places. This promoted Buemi up to second place, with a gap of 4.9 seconds to Rosenqvist ahead. Faraday Future Dragon Racing’s Loïc Duval then briefly stopped on track, although he was briefly able to get going again in 18th place. A determined Vergne was soon on the tail of his countryman and fellow Renault-powered driver Prost, while the other Renault e.dams car of Buemi closed the gap to the leader Rosenqvist up to just 1.9 seconds. With Rosenqvist having stopped a lap earlier than Buemi, he had to save energy which allowed the Swiss championship leader to close right up to his rear, the gap dropping under a second on lap 27. Meanwhile Lucas di Grassi passed his team-mate Daniel Abt for P6, as he attempted to salvage as many points as possible after a disappointing qualifying. A few corners later, Rosenqvist was finally passed by Buemi, as the Swiss driver used his surplus of energy to full effect to pass the Swede. Five laps remained for Rosenqvist to try and take the lead back from Buemi, although it looked a tough ask at that stage. After Vergne was unable to pass Prost, di Grassi closed up to the back of the Frenchman, and was eventually able to pass him for P5 despite some strong defending from the Techeetah driver ahead. Up ahead, Bird was pressuring Rosenqvist for P2 with three laps to go, as the Swede struggled to make his battery last a full race distance. Bird finally got past with two laps to go, as Rosenqvist’s attention changed to maintaining his podium place. Duval was able to set fastest lap with a few laps remaining, before his car stopped on track for the second time on the final lap. Panasonic Jaguar Racing’s Mitch Evans, meanwhile, went off track and brought out local yellow flags – however these were soon brought back in and the race was able to finish under green flag conditions. The closing stages passed without incident for the leaders, with Buemi crossing the line to win his second ePrix in a row, having started way down in seventh. Bird came home in second place, ahead of the hugely impressive rookie Rosenqvist. Four seconds further back in P4 was Nicolas Prost, who kept his place ahead of the ABT duo of di Grassi – up from 12th on the grid – and Daniel Abt. The top 10 was rounded out by Turvey, Vergne, Nick Heidfeld (Mahindra Racing) and DS Virgin Racing’s José María López – who scored his maiden Formula E point. The fastest lap point went to Duval after a challenging day for the Frenchman. The fastest lap of 1:22.600 was set by Loic Duval. Who is your driver of the race? Let us know on twitter! 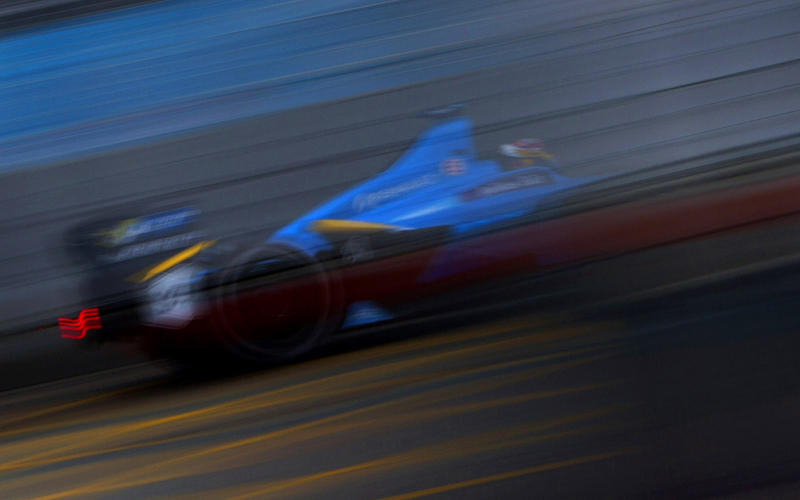 Main image courtesy of FIA Formula E Media. Other images courtesy of FIA Formula E Media and Rajan Jangda.